One of our favorites-the mirrored interlocking script letter! 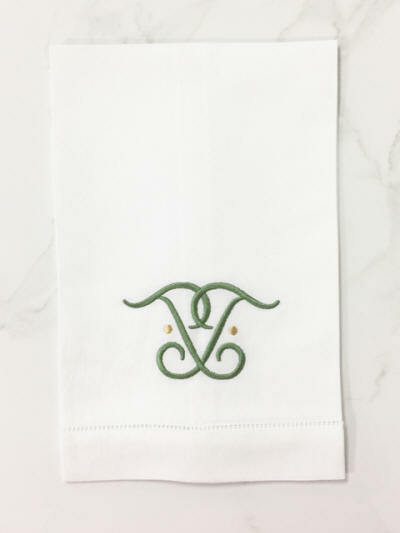 You will love this monogram if you are looking for a design that is personalized yet a bit simpler in apperance than an ornate monogram. Looks lovely in one or two embroidery colors. For color matching, send a fabric, paint or wallpaper sample for complimentary thread swatches. Guest towels measure 14"x 22" . Gift pairs arrive in our Signature Box with satin ribbon.